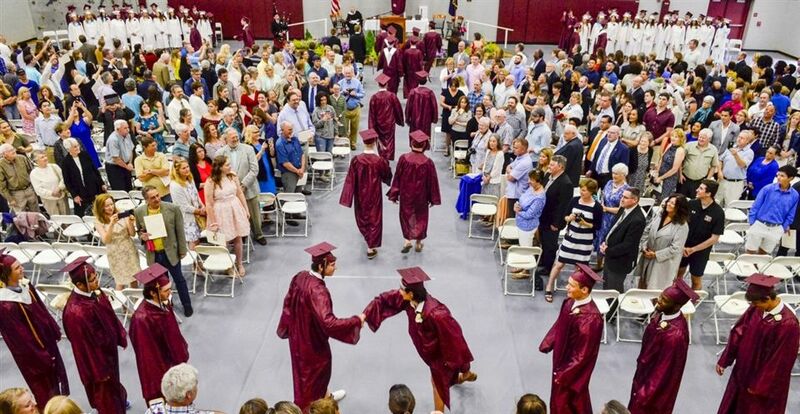 READFIELD — In a quiet moment after his Kents Hill School graduation Saturday morning, Robert Coakley reflected on what he might tell incoming high school students about the experience he just completed. “OK, there’s a lot I can give,” Coakley, 19, of New York City, said, as his classmates, their families and Kents Hill teachers gathered in the ice arena following the ceremony for photos, handshakes, tears and hugs. “The main thing is, be yourself. Don’t be in a shell. Just be you. Don’t be shy. Join the sports teams, join the clubs,” he said. Coakley transferred to Kents Hill as a repeat sophomore and spent three years completing his high school studies. In the fall, he’ll attend Hobart and William Smith Colleges in Geneva, New York, where he’s considering studying sociology and perhaps law. This summer, he’ll attend an environmental studies program at the college. That was not the only advice handed out as the school sent 72 of its students from 11 countries and Maine and nine other states who graduated from the private, co-ed boarding school in Readfield. At the ceremony, held in the Harold and Ted Alfond Athletics Center because of the threatening rain, the school welcomed back Rist Bonnefond, headmaster emeritus, who stepped down from his position at the end of the 2010-11 school year. He offered his thoughts for a period that’s marked by unprecedented disrespect and dishonesty. Despite that, he said he has optimism about the future because of the Kents Hill graduates and what they have learned in their time at the school. The senior address, delivered by Leah Tsehai Herbin of Somerville, Massachusetts, was a reminder that grief touches all. In recalling her impressions of her time at the school and revisiting fond memories, Herbin spoke about the death of her father earlier this school year and the support she received from her classmates, and her hopes for future graduates of the school. The ceremony’s other somber note was a moment of silence was observed for Reina Nakamura, of Tokyo, who would have graduated this year. She died in 2016 just before she started her junior year. Her name was listed among the school’s graduates in the program. In celebrating the traditions of the day, the graduates and faculty were accompanied by bagpiper Stephen Gorry as they marched into and out of the hall, and the Rev. Myung Eun Park welcomed the families gathered in their native languages before delivering the invocation.